We have reached the time of year when it’s dark as I leave in the morning and dark when I return home, which, while not depressing in a seasonal affective disorder way, certainly affects my mood. I make my way out to the car in the pre-dawn chill, huddled close and indrawn. The windshield flares with crazy, sparkly frost patterns when Ben switches on the headlights. Sort of chiaroscuro for the soul. (Guaranteed, I won’t feel this romantically about dark mornings come February, so let’s enjoy it while we can.) We winterized this weekend: tacking sturdy plastic over the mesh door to the chicken coop, planning to hook the ducks up with a heat lamp, bringing in loads of firewood and stacking it beside the woodstove. I like these tasks; they’re comforting and necessary, in an Aesop’s fable kind of way (remember this one?). Warm, spiced baked goods fit the bill, too, these days. This cake/quick bread is the best I’ve made in recent memory, nutty with the browned butter and densely moist from the squash, perfumed throughout with cinnamon and cloves and ginger. If you’re storing up for winter like us, double the recipe and bake two. If you wrap the loaf tightly in plastic and freeze it, you can defrost and eat anytime over the next few dark months. Brown the butter first: Melt the butter in a small skillet over medium heat until toasted, giving off a beautiful nutty aroma. If your pan is dark colored, be vigilant. You want the dairy solids in the butter to be brown and toasted but not scorched. For me, over medium heat, this takes 5-15 minutes (still haven’t figured out why there’s so much variation). Stir in the nut or seed oil if using. Remove the butter from the heat source and allow it to cool, but not to harden. Now, preheat the oven to 350 degrees Fahrenheit. Butter and flour a 1-lb loaf pan. Whisk the flour, baking soda, cinnamon, cloves, ginger, and sea salt into a large bowl. In another bowl, whisk the sugar, eggs, squash, and milk. If your squash is a bit lumpy in the mixture, press it through a sieve. Test the butter’s temperature with your finger—if it is cooled and not still hot, stir it in to the wet mixture (if not, wait a few more minutes—you don’t want to cook the eggs). 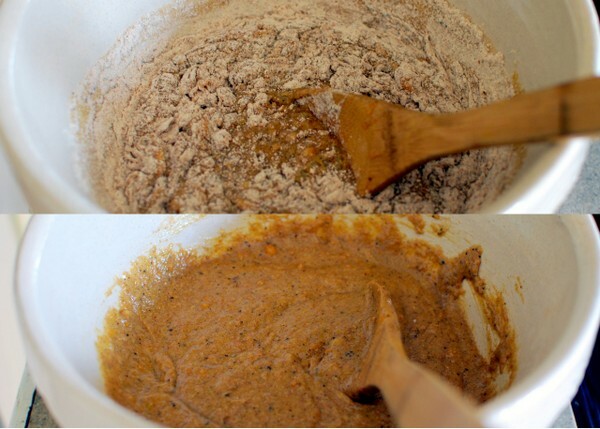 Stir the wet ingredients into the dry mixture until just combined. Pour the batter into the prepared pan and sprinkle liberally with the 2 tablespoons of sugar. Bake the cake for about 50 minutes, until start to pull away from the sides of the pan and the center of the cake no longer jiggles. As Heidi says, do your best to avoid over-baking, as part of the charm of this cake is how beautifully moist it is from the squash. i will be making this asap. I have a cocoa banana loaf that we’ve gone through in 1.5 days and another one happening tomorrow. and then this :) ’tis the season for warm loaves that go well with coffee. Enjoy the holidays, my dear! That looks delicious. I love anything with browned butter! We are entering Summer here and your description took me right back to the beginning of winter – I even felt warm and cosy! Love the term ‘winterizing’ – and how good is Heidi Swanson? Just gorgeous photos, I’ll be making this one. Mmm, Sarah, I was thrilled to see this recipe for something baked with kabocha squash. They are widely available here in Bangkok, and I have fallen madly in love with them for savory dishes, but have not yet baked with them. This is a must-try! Enjoy those early season snowflakes. I miss them. Love kabocha! Tied with butternut for my favorite squash. I absolutely love your description of chiaroscuro for the soul, beautiful. This cake looks delicious, a bit like pumpkin bread grown up. I’ll definitely make it soon and, when I do, I probably will double the recipe to make two. Keep warm! This is such a perfect winter cake, full of spice and warmth. pretty, pretty cake. sounds so comforting and warming to the soul! I’ve made a version of this cake twice in the past two weeks that I’ve been planning on writing about! You know what they say about great minds. It is such a comforting, yet addictive cake. I’ve been using nutmeg flour and Hokkaido pumpkin. So good. Oh, you make me want to curl up with a good book, a cup of tea and a slice of your loaf. I guess I’ll have to go and bake one now. Love the writing and am anxious to try the recipe. I’ll sub in some gluten-free flours. This looks wonderful. Thank you ! Quick breads have such immediate reward; one bowl and a big measuring cup, a few utensils and an hour or so in the oven and you’ve got a masterpiece. I have been experimenting with varied squash in a tried and true pumpkin bread recipe and loving the results. Since I always double them, we’re set for a while, if I can resist pulling one out every other day. This recipe, and the results look wonderful. I can’t seem to get enough of warmly spiced baked goods as of late. This looks really delicious and it’s definitely going on my list. I really enjoy the routine tasks of preparing for winter, and picturing your ducks with their heat lamp made me smile. The spice cake would be lovely with a cuppa tea. This cake sounds so amazing but I’m out of fine sugar – all I have is turbinado at home right now. How do you think that would fare in this cake? I noticed that this recipe has an amaranth flour tag, but I don’t actually see it in the recipe. I think you might have left it out of the ingredients list. I love the flavor that amaranth imparts and look forward to trying this. I have a spaghetti squash I from my CSA I need to use up. Sarah, do you think I could use if for this recipe if well cooked and finely pureed? I haven’t found a recipe for this type of squash that I really like and have been stalling to use it. There’s no reason why you couldn’t use spaghetti squash in this if it was well-puréed. Really, any winter squash can work. That said, I tend to prefer it in savory dishes. Spaghetti squash has a much lighter, more delicate taste that might get lost when baked into a cake. Acorn/kabocha/butternut types are a little richer and nuttier. I made this cake at thanksgiving but used Rachel Ray’s recipe. I didn’t turn out at all. the center was solid and the cake was very heavy. I made some pumpkin bread last week and the same thing happened. The only thing I can think of is that I may have overmixed the batter as I was using a electric beater. Also I didn’t puree the squash. Any ideas about what went wrong? I will try your recipe next time as is sounds much better! Hi Sarah, I made this recipe and shared it with my mum, husband and another friend. They all loved it! It had lots of new flavours in for me (the pumpkin in a sweet dish, the amaranth flour, the oil I used, which was a hemp seed oil, and the browned butter which I’d never made before), so I wasn’t sure which I was tasting, but we all really enjoyed it – the smell of the butter was amazing, it took me back to being a kid making toffee & fudge and the lovely smells of those! I used baking powder instead of bicarbonate of soda / baking soda, and mine didn’t seem to rise as much as yours. The sugar on top was also lovely as it melted to a nice soft glaze / crust. Thank you so much for the inspiration! I just started reading your blog and am really enjoying it – thank you for sharing what you’re doing! You are currently reading Sparkling brown butter spice cake (with kabocha squash) at The Yellow House.